I can only imagine what Carter’s life was like the first year . The pain, how scared he felt, if he was hungry or cold ?? It hurts my heart when I think about it. 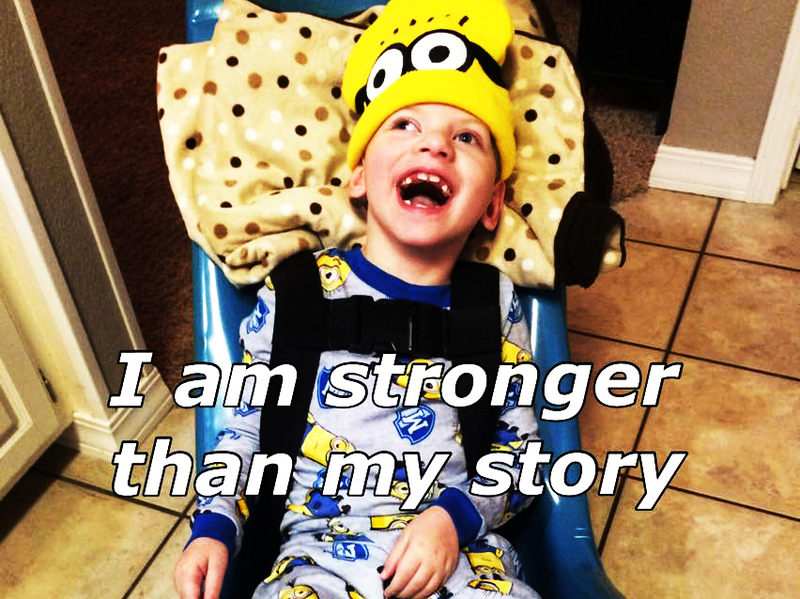 That I am Carter, a SURVIVOR of Shaken Baby Syndrome !! When I was a tiny 5 week old baby on October 24, 2009, my biological dad became angry at me for crying. He shook me violently and threw me against a wall. As a result I had a serious brain injury, retinal bleeding in both eyes (leaving me legally blind), a broken clavicle and swelling and bruises to my face. I spent almost a month in the intensive care unit – I was very sick . The doctors told my family I would need a lot of special care the rest of my life . My dad was in big trouble for hurting me and was sentenced to prison for 32 years . It came out that I had been shaken many times before he really hurt me . DHS placed me in foster care because my biological mom was not taking good care of me after I was injured – not very good care at all. I lived with a new family but things weren’t so good there either . I wasn’t gaining weight and my day care was very concerned about me – a lot of people were I guess . When DHS finally came to take me to another home I was found on the floor laying in animal waste . I didn’t like it very much there . This time I went to a really nice family but just until a permanent home was found for me . In January 2011, I had a new home to go to . The Fowler’s house . My new mommy seemed very excited to meet me . She held me a lot and gave me lots of hugs and kisses . So did my new dad . I had two new brothers and two new sisters . I felt safe and loved in my new home right away . I was very sick the first few months at my new home but my family never left me alone when I had to go to the hospital . One day I choked because of the bad reflux I have. I then had a seizure not long after I choked and I stopped breathing . My mom had to do CPR on me and I remember my mommy crying so hard at the hospital . I had to fly in an airplane to a big hospital and stay there til I was all better . My mom was with me the whole time . The doctors told my new family I probably wouldn’t live very much longer but that didn’t stop them from loving me . Slowly I got better and was actually making a lot of progress- I surprised my doctors . I started going to a special daycare while mommy and daddy worked. I get all of my therapies at my new daycare . I take speech, physical, occupational and vision therapy several times each week . I got stronger and grew bigger and even healthier . I was getting sick less often and spent less time in the hospital . Oh yea, my mom still kisses me and tells me I am her brave boy everyday – that makes me very happy. My mom told me I can do all kinds of things – she told me to be patient and never ever give up . I really love my mom and dad and family – they simply loved me back to life . In March 2013, I became a Fowler for ever . I was so happy and I know my mom and dad were too . I have a forever family and am so excited. I still require a lot of care. I have cerebral palsy bc of the lack of oxygen from when I was injured . I cant do anything for myself. My arms and legs don’t work like they are supposed to . I have such bad reflux I choke almost everyday . Sometime just a little bit and other times I get so choked I get very scared . My mom and dad are so nice to help me and it doesn’t scare me as bad when they hold my hand and say sweet things to me. I have a special tube that feeds me through my stomach . I have to be hooked up to a feeding pump about 16 hours each day . I am legally blind but I love to look at the light . I hurt a lot from painful spasms mostly in my legs . I take a lot of medicine several times a day to help me. That’s a lot for a little guy like me to deal with everyday . Don’t you agree ? But, I still enjoy life just in different ways . I love to giggle at funny sounds . I love to have people talk to me and play with me . I am 6 years old now. I am doing better than ever . I will always be injured because of what my bio dad did to me but I try very hard to accomplish new things all the time . I wish I could do more and be like other kids but I can’t because of a terrible thing called Shaken Baby Syndrome . I wish adults would learn from what happened to me and other babies and kids would not have to go through this too . My Uncle Larry and Aunt Danielle wanted to do something very special for me to prevent more babies and kids suffering like I do. Uncle Larry went before legislatures and is responsible for getting Carter’s Law passed in Arkansas in April 2013. Act 1208 of 2013 . One aspect of this law will educate others on the dangers of SBS and normal crying periods for babies. My mom is trying hard to make people aware of the dangers of shaking a baby . We go to junior high and high schools to educate students and this is making a huge impact . Seeing Carter is a harsh dose of reality . Did you know that it takes as little as 3 seconds to injure a baby forever or they can even die from this ? That is pretty scary . God gave us the biggest blessing 5 years ago. Carter came to us through foster care and is now legally our son . Our life with Carter is very blessed. In reality, it’s also very hard. We are constantly fighting with insurance to get Carter the equipment and therapy he so badly needs. Many times it is denied by insurance so fundraising has unfortunately become a necessity to get Carter the equipment he needs. It’s hard to ask for help, but as a parent I would go to whatever lengths I need to to get my son the help he deserves. The harder part of reality is watching Carter hurt and struggle with very little we can do to prevent it . My heart breaks because a child should not suffer from something so preventable. Carter has made big improvements in certain areas and other areas I see the hope dwindle away the older he gets. One of my big hopes is that Carter will get head control. He can hold his head up but it is very random and not for very long at all. I also would love to see Carter be able to bear weight on his legs. As he grows this would be a tremendous help with transfers. He is now 42 pounds and 44 inches tall. In reality he feels twice as heavy as I lift him and move him everywhere he needs to go. I worry sometimes what I would do if my back gives out. I pray every day and ask God to keep me healthy and strong so that I may take care of HIS child. As of right now Carter stands in a stander an hour each day and this is helping to build up his strength in his legs. Being in the stander also has many other benefits for him . Carter’s left hip is 50% out of the socket. The more he can stand on his legs hopefully we can avoid a very major surgery that is often required on children who are non-weight bearing. Carter has cortical vision impairment leaving him legally blind . His ophthalmologist did put Carter in glasses about two years ago. He feels Carter may see shadows and the glasses may help to define what Carter sees. Since Carter is non-verbal it is very difficult to assess exactly what he can see. We can definitely tell he knows the difference between light and dark but beyond that we may never know. He wears a patch over one of his eyes each day for four hours. This helps to strengthen the muscles in his eyes. Carter continues to have painful muscle spasms and such severe reflux he often chokes . As a mother this is so very hard to watch because I feel so helpless. Despite all we do to help Carter with his therapies and medication the spasms and choking still happens. He continues to get fed by a feeding pump for 18 hours a day. Carter more than likely never be able to have food or drinks by his mouth. He has many hours each week of speech, occupational and physical therapy. I feel very blessed because we have a wonderful daycare that Carter attends while I work. It is a developmental daycare . He gets excellent nursing care and all of his therapies are given while he is at daycare . Carter will be in public school next year and all this will change. We will have to start getting his therapies outside of school which mean lots and lots of trips back-and-forth to therapy. I don’t look forward to that only because it will pose a great challenge with me trying to work and get all of his therapies in. Carter will qualify for therapy in school but he would need much more than what they can offer. Carter is and will always be 100% total care. This is the reality for many babies and young children that are shaken. Carter’s life was stolen from him on that day, the life he was born to have. Did I mention that he takes as many as 14 schedule doses of medication each day. The medication helps with his tight muscle tone, painful spasms, choking issues, seizures and stomach issues. He also continues to get painful Botox shots every 3 to 4 months . The Botox is very beneficial in reducing the stiffness in Carter’s muscles and the painful spasms. Carter has been very sick and has been in the hospital twice since October. He is doing much better and I think he has gained back most of his strength. Despite all of the hardships and struggles that Carter has each day he is a very happy child. We strive to do things that allow Carter to enjoy life in ways that he can. As his mom it hurts my heart very much to know how bad Carter struggles each day. But I know this is Carter’s life and this is the only life has ever known. When I see his big huge smile and hear his contagious giggles I know he is happy. And that makes me very happy. Things that make Carter especially happy are when his big brother Artie plays with him , he hears other children laughing , certain random sounds can cause the most amazing giggles and sitting on his mom’s lap getting lots of snuggles . Carter goes to Jr high schools to educate students on the dangers of shaking a baby too. He is loved so much by our large extended family, friends and people all over the world through Facebook. Carter’s Law is raising a lot of awareness in Arkansas. Junior high and high school students are being educated in many parts of the state. Daycare facilities, hospitals, birthing centres and health departments as well as doctors offices are all required to educate on shaken baby syndrome. Carter’s Facebook page has over 63,000 followers from every state in the US and 17 countries worldwide. Such an impact this little boy is making. God is a merciful God and Carter’s suffering is not in vain. I have received the most amazing messages of how Carter’s story helped a parent have more patience with their child . I have even been told that as a parent became so frustrated with their child , Carter popped into their head and they stopped and hugged their child and just cried thinking what COULD have happened . Carter’s story is being told all over the world . We thank you for this . So much awareness happening because of our sweet little boy . Dear Ellen I have watched your show many, many times . You make miracles happen. We are in desperate need of a WC van . We have 2 other special needs children so we are asking for your help . Artie was also adopted and he has many special needs . Artie is 14. He has autism spectrum disorder and some health issues and severe developmental delay. He will make you laugh and smile on even your worst days . Did you know that by between 1,200 – 1,400 babies die or are we left severely injured for life every year? SBS is 100% preventable . The number one way to prevent SBS is to raise awareness about normal crying and how to have a plan. What to do if you feel frustrated or angry with your baby. Put the baby in a safe place and walk away. Check on the baby every five or 10 minutes until you are calmed down. Do not be afraid to ask for help. Babies don’t die from crying but they will die or be severely injured if they are shaken. Never shake a baby !!! Follow Carter’s on Facebook Flipgram page. Want to send this story to Ellen? 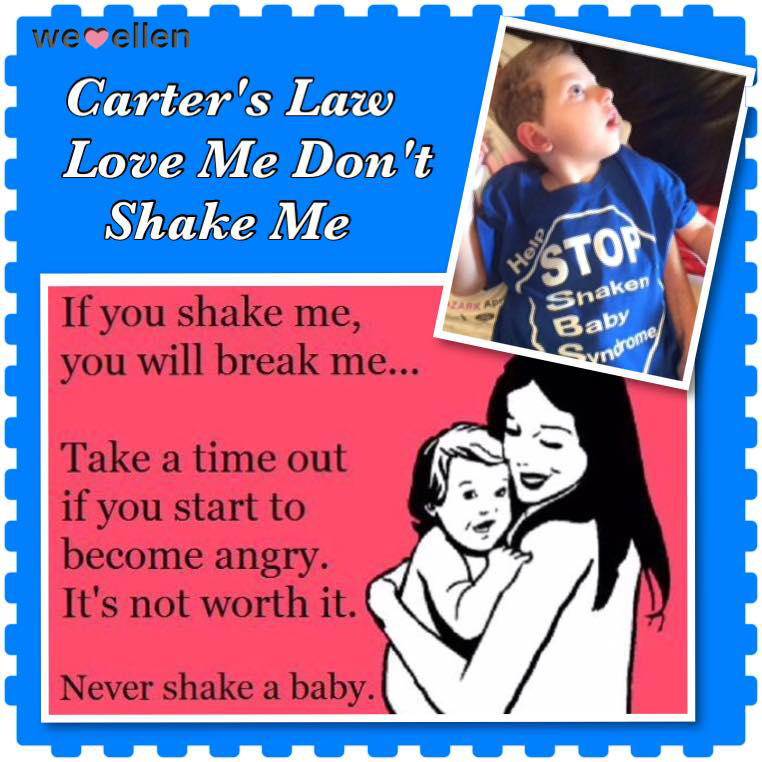 We Love Ellen: I am Carter, a SURVIVOR of Shaken Baby Syndrome ! !